My second #SNAPChallenge is starting tomorrow and today I am prepping for the week. After my last #SNAPChallenge I had a surprising amount of food left, which is outlined here. I did a bit of shopping tonight, after I returned from a quick trip out of town for Memorial Day. The total cost was $26.94 plus tax. 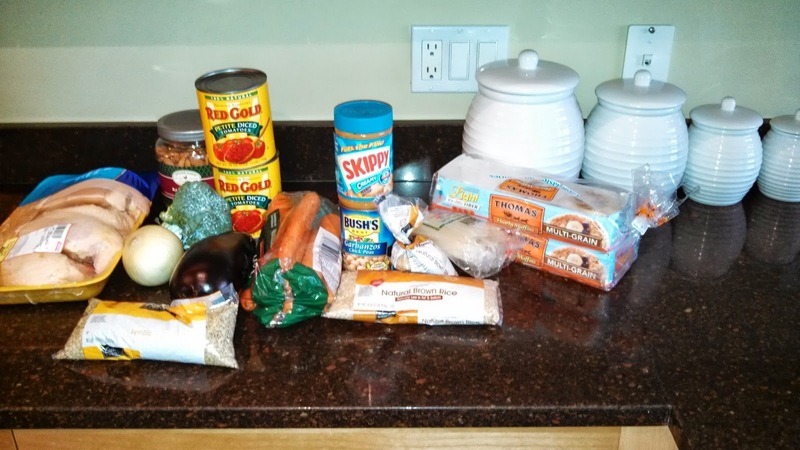 My goal this time around was to find things to eat that are more filling for a longer period — more proteins and less carbs — which is why I bought the lentils, the raw almonds and the chicken breasts. I figure I can eat one breast a day for the week. I am starting off by cooking the Tomato Garbanzo Soup that I made last time I did this Challenge. I’ll eat this for lunch for the next few days and hopefully remain full longer than I did before. Wish me luck tomorrow on my first day of living on just $35 / week. By Tim in Food on May 27, 2013 .